May 15, 2012 -- Tariq Ali's keynote lecture on the state of Europe presented at the annual Subversive Forum, the theme of which this year was "The future of Europe", held in Zagreb, Croatia, May 13-19, 2012. He explains the evolution of the European Union and its role, and touches on the crisis in Greece. Salmaan Taseer, assassinated governor of Punjab. January 8, 2012 -- Links International Journal of Socialist Renewal, a longer version of this article will appear at Viewpoint -- Just over a year ago, Salmaan Taseer, governor of Pakistan’s largest province, the Punjab, was assassinated in the most cowardly manner by a government-assigned security guard in federal capital, Islamabad. The killer, a trained commando of the Punjab Elite Force, Mumtaz Qadri, pumped 27 bullets into the Governor’s back as he headed to his car on the afternoon of January 4, 2011. This sensational murder rocked the nation and reverberated around the world. It was not a spontaneous enraged act but a well-thought out, cold-blooded plan. One man executed this plan – but was he acting alone and was it an act motivated only by "religious fervour" as has been depicted, or is there more to the issue than meets the eye? And even if the action was purely altruistic, should the law of the land not be applied to punish the guilty? December 26, 2011 -- Links International Journal of Socialist Renewal -- The progressive and democratic forces of Pakistan and Afghanistan met here in Lahore for two days [December 21-22, 2011] in the first ever joint conference. This is a historic step for the progressive forces of both sides to sit together and share the sufferings of our people at the hands of US-led NATO forces as well as the religious extremists in the form of the Taliban. We also vehemently condemn the military establishment and the governments of both countries who use different excuses to justify the occupation by foreign forces as well as [being the] tacit [patrons] of religious extremism. We resolve to launch a sustained campaign against the forces of imperialism and religious extremism. We plan to organise coordinated days of action and other initiatives at the political as well as the cultural and educational levels. We plan to broaden this movement and include other left and progressive forces who share the common goals of establishing a just peace and of progress in the region. We resolve to also include the progressive movements in India and Iran in order to build up a broad regional alliance to secure a just peace. "The lesson of Saddam Hussein, Hosni Mubarak, Ben Ali and now al-Gaddafi is that friends can be quickly forsaken by their Western patrons when the writing is on the wall." October 21, 2011 -- New Civilisation, posted at Links International Journal of Socialist Renewal with the author's permission -- British Prime Minister David Cameron’s statement regarding the killing of Muammar al-Gaddafi will go down as another piece of brash hypocrisy, which would be breathtaking if it was not so expected from the British premier. He mentioned that he was “proud of the role that Britain has played” in the uprising – intending of course the support given by NATO once it was clear that the Libyan people had risen up against the man en masse. October 17, 2011 -- Antipodean Atheist, posted at Links International Journal of Socialist Renewal with the author's permission -- The Washington Post, the highly influential US newspaper, reported that the top US general in Afghanistan predicted that the Taliban would collapse as a viable fighting militia over the next several months, and eventually accept the offer of national reconciliation from the US-supported Afghan government. This confident prediction was backed up by a note of caution; the general warned that the Taliban could still strike. But he was optimistic about the "progress" of the counterinsurgency in Afghanistan. There is just one thing to note about this report: this prediction was made in April 2005. This month marks 10 years since the US invaded Afghanistan in 2001, and the Afghan war shows no signs of abating. 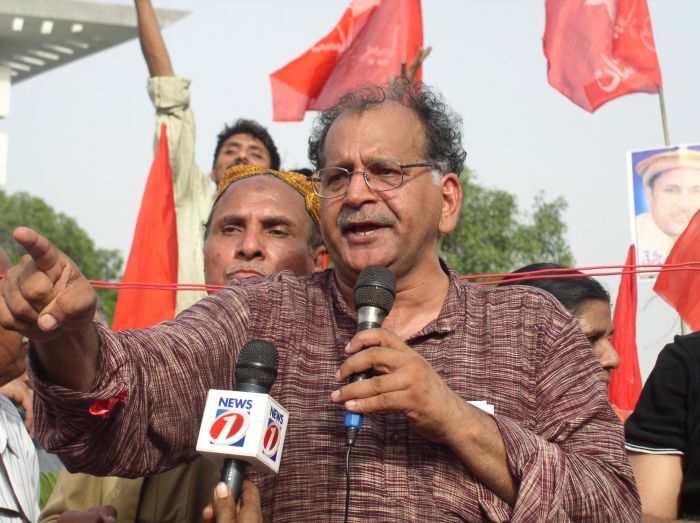 October 3, 2011 -- The Labour Party Pakistan's spokesperson Farooq Tariq and human rights lawyer Sonia Qadir addressed the World at a Crossroads: Climate Change, Social Change conference in Melbourne. For more material from the conference, click HERE. Film produced by Jill Hickson and John Reynolds. September 17, 2011 -- Antipodean Athiest, posted at Links International Journal of Socialist Renewal with the author's permission -- Near where I live in Sydney, there is a war memorial commemorating all those people from the area who have died serving the Australian armed forces in wars overseas. There are columns for each war Australians have participated in, followed by the names of those who never returned. For instance, there are columns for World War I (1914-1918), World War II (1939-1945), the Korean War (1950-53), and also the "International Campaign against Terrorism (2001– )". Notice that last one? 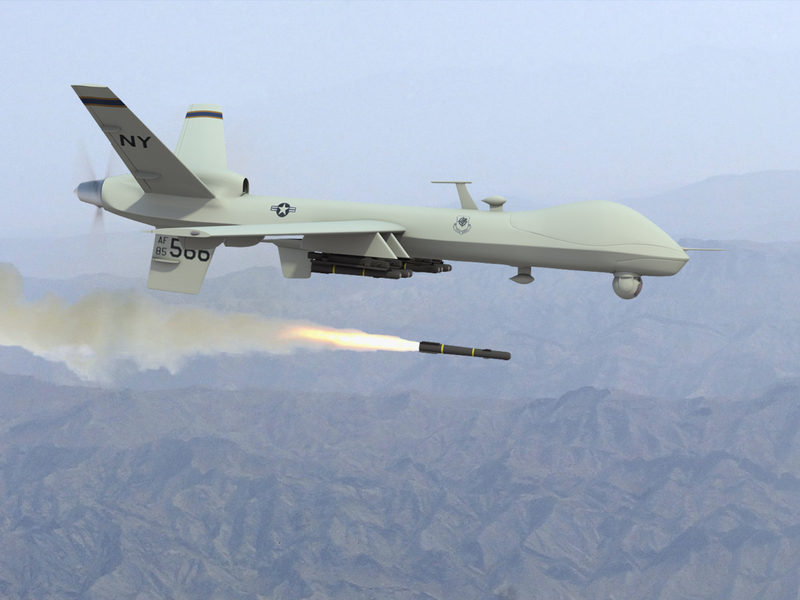 Unlike the others, the war on terror has no end date. The horrific terrorist attacks of September 11 prompted justified outrage at the perpetrators and sympathy for their victims. Since then, there has been a continuous barrage of war crimes, an escalation of US wars in the Middle East, new offensives against Iraq and Afghanistan by US imperial power, and a steady erosion of democratic civil liberties in the name of a "war on terror". In fact, the first decade of the 2000s can rightly be called the savage decade. Did Wikileaks reveal a US blueprint for Libya? August 26, 2011 -- Electronic Intifada -- The US administrations of presidents George W. Bush and Barack Obama were set on developing deep “military to military” ties with the Libyan regime of Muammar Gaddafi, classified US diplomatic cables released by Wikileaks on August 24 reveal. The United States was keen to integrate Libya as much as possible into “AFRICOM”, the US military command for Africa which seeks to establish bases and station military forces permanently on the continent. “We never would have guessed ten years ago that we would be sitting in Tripoli, being welcomed by a son of Muammar al-Qadhafi”, US Senator Joseph Lieberman said during an August 2009 meeting, which also included senators John McCain and Susan Collins. The Sun, a flagship daily of the disgraced Murdoch empire, immediately prepared a front page that described the far-right attack as an "Al Qaeda Massacre". July 27, 2011 -- Jadaliyya -- Media coverage of the Norwegian tragedy was led with dangerous and clichéd arguments about "Islamic extremism" and multiculturalism, even after the identity of the killer was confirmed – thus contributing to the mainstreaming of racism that helped make far-right mass murderer Anders Breivik what he is. 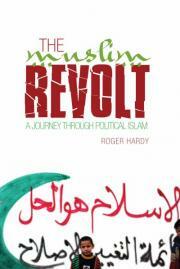 An hour before Breivik embarked on his massacre of the innocents in Oslo on July 23, he distributed his manifesto online. In 1500 pages, this urgent message identified “cultural Marxists”, “multiculturalists”, anti-Zionists and leftists as “traitors” who are allowing Christian Europe to be overtaken by Muslims. He subsequently murdered dozens of these "traitors", the majority of them children, at a Labour Party youth camp. His inspiration, according to this manifesto, were those pathfinders of the Islamophobic right who have profited immensely from the framing and prosecution of the “war on terror”, including Melanie Phillips, Bernard Lewis, Daniel Pipes, Martin Kramer and Bat Ye’or. Three o’clock in the morning on May 1, Washington DC erupts in celebration of the killing of Osama bin Laden. May 20, 2011 -- Early in May 2011, Osama bin Laden, a Saudi billionaire criminal and religious fanatic, was murdered by US Navy SEAL troops in Pakistan. Bin Laden was a reactionary political figure, who promoted obscurantist, fundamentalist prejudices in the service of criminal wars and terrorism. He was a long-term ally and asset of the United States, whose repugnant views and activities were cultivated throughout the 1980s during Washington’s Cold War campaign against the secular, socialist government of Afghanistan.